Evidently, Mr. Mario Batali whipped up this recipe on one his shows. In a medium-sized mixing bowl, combine the canned sardines, eggs, garlic, parsley, pepperonchini, bread crumbs and cheese. Using a wooden spoon stir lightly, not to mash mixture. Set fish mixture aside. Fill a deep pot no more than halfway full with the olive oil. Heat over a medium flame until the temperature reaches 350 degrees F. The oil should remain at or around this temperature throughout the frying process. 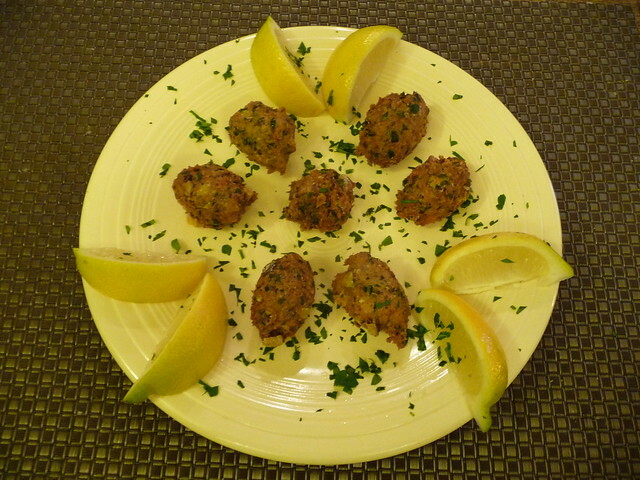 Using a spoon, make fritters into semi-balls. When the oil reaches temperature, gently drop the fish balls into the hot oil. Be careful not to splatter the oil. Fry each fritter to a golden brown, about 2 minutes. Carefully remove the cooked fritters with a slotted spoon and reserve on a serving dish. Repeat until all of the fish mixture has been used. These fritters are best served hot with a squeeze of fresh lemon juice. I'm cutting the recipe in half and using Pollastrini di Anzio all'Olio d'Oliva. I bought two tins as the recipe calls for, but now I'm going to eat one while cooking dinner. A quality tin was called for. Six fish. In Both Tins the fish are kinda mangled but whole, little notches out of the sides. one or two broken. No tail, firm clean flavor. Satisfactory, but not as good as the Piccantis. Three out of Five Tins. 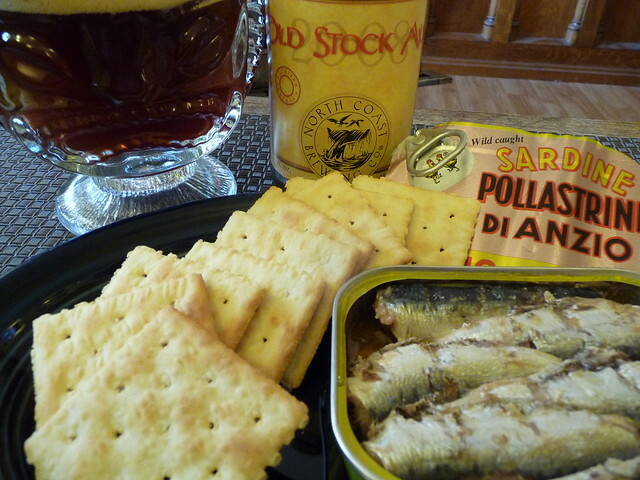 As for the Canned Sardine Fritters? Are you kidding? They're fried! They're delicious! Didja see that list of ingredients, you love all those ingredients. They were so good, we already started thinking of variations. You should make these tomorrow. Five out of Five Tins. Whoa, 2008 North Coast Brewing - Old Stock Ale. 12.5%. It's a mouthful of warm sweet malty fireside kiss that leaves you light headed and giddy. Too bad I only bought one, hmmm, what's next? Hopefully I can get the Wife to whip those up before she leaves for Paris next week...for three weeks. Then my taste buds will, longlingly, await her return. Or I can just prepare them myself.